The Guardian is an aptly named pistol. If I were in the executive or VIP protection business this is the type of pistol I would want to carry; a compact, easy to shoot single action pistol, with the comfortable and familiar 1911 ergonomics and chambered for the hard hitting .45 ACP. In fact maybe I'd carry two of them. The appearance of the pistol also befits someone guarding a VIP with its deep richly blackened alloy frame topped off with a matte finished stainless steel slide whose sides have been nicely polished. The slide also contains a section of generously cut rear cocking serrations; thankfully there are no abysmal front cocking serrations breaking up the sleek lines of the slide. The package is complete with a set of beautiful cocobolo grips combining checkering along with sweeping smoothly finished sections that swirl into the STI logo in the center. This is a very handsome pistol. The Guardian is 7.5 inches in length, weighs 32.4 ounces, has a skeletonized trigger that breaks cleanly at 5.9 pounds and sports a 3.9 inch fully supported ramped bull barrel. As such there is no barrel bushing and unfortunately that means that the pistol contains a full length guide rod. STI has branded this design the "Recoil Master" guide rod which is a multi-springed contraption that reduces muzzle flip and recoil. Honestly, I cannot tell how much recoil it reduces but I can tell you it makes the pistol difficult to break down and reassemble. To disassemble you must retract the slide and the push down on the cylinder surrounding the guide rod that contains the interior set of springs. While holding the retracted cylinder back, you clip a plastic collar over the rod between the retracted cylinder and the tip of the guide rod. This holds the spring in it's retracted state allowing you the ability to slip the entire Recoil Master guide rod out of the slide. This is difficult to do and my plastic collar was too long requiring me to file it down a bit until it could be properly deployed. Atop the slide sits a nice set of 3 dot sights Tactical Adjustable Sights. The sights are a low-profile Novak-type configuration, designed to eliminate the chances of them snagging upon being drawn from concealment. I was slightly surprised to see that they did not have a "racking shelf" cut into the rear sight which would allow an injured shooter to hook the rear sight on a belt, table edge, etc. in order to rack the slide one-handed. Sometimes I wonder how necessary the racking shelf actually is. If I am carrying with a round in the chamber I won't need to retract the slide in order to ready the pistol to shoot. STI is known for making competition pistols on the 1911 platform and as such they know how to make an accurate and reliable pistol. Inaccuracy and unreliability will cost you points in a competition and could cost your life if you are faced with imminent danger. 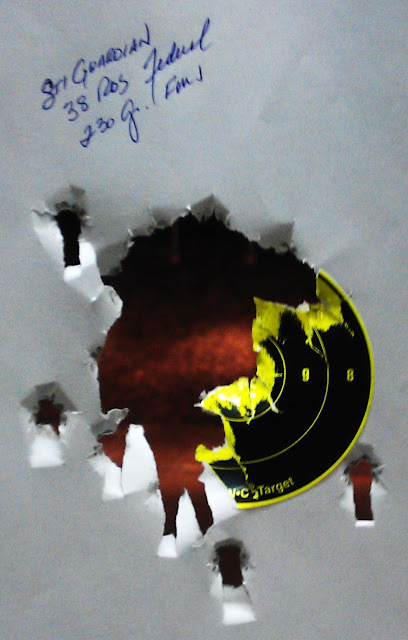 The target above was the first 12 rounds of Federal 230 Grain FMJ ammo fired at 21 feet. While the rounds landed a little left of the point of aim, it is a great grouping with one shooter induced flier. The target below was also shot at 21 feet. By now I had worked with my grip and trigger finger placement and was able to post this grouping on a smaller four inch target and much more centered. 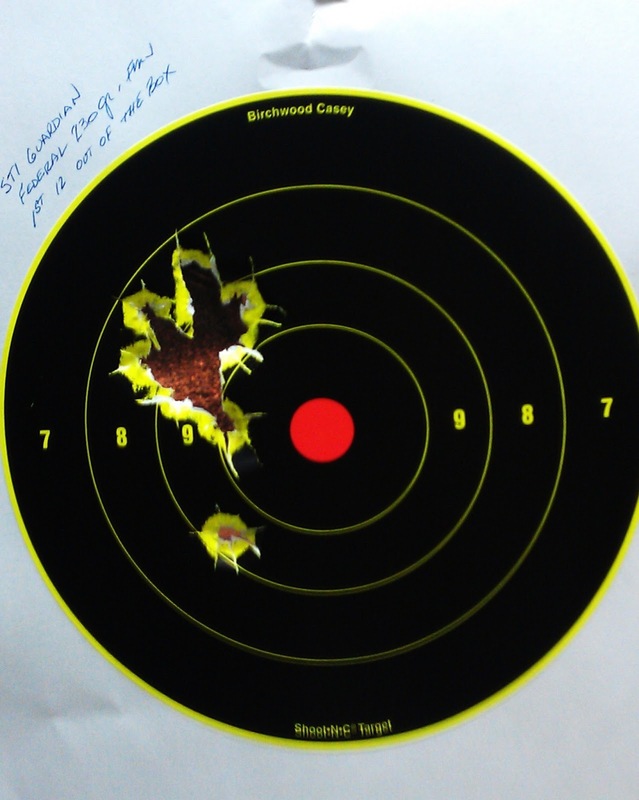 The target below was fired at 30 feet with the hot Hydra Shok 230 grain + P ammo. And this target was shot with Speer Gold Dot Hollow Point 230 grain ammunition. 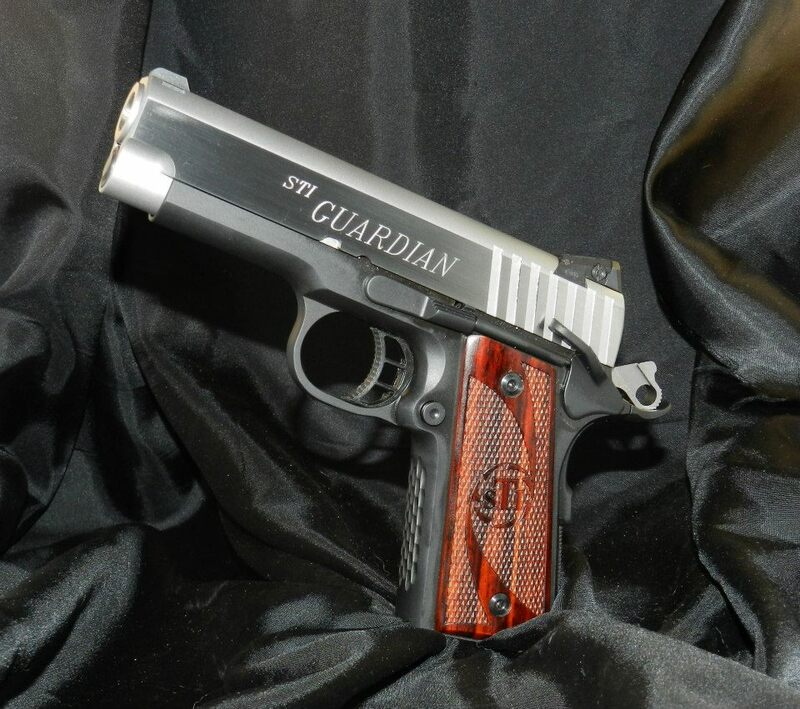 The STI Guardian is a serious pistol; it is a serious performer and seriously handsome. A side benefit is its 6 + 1 capacity which will pass muster with the ridiculous magazine restrictions being proposed by various federal and state governments. I wonderful review. I have been curious about this STI model for awhile. Thank you for enlightening me. On a side note, I believe somewhere in editing the last two photos of the pistol itself got replaced by what I think is a Sig GSR. I love your reviews - thank you for taking the time to test them and post pictures of the groupings etc.